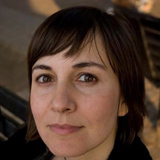 Tânia Moreira David is a portuguese filmmaker and architect. She studied architecture, fine arts, and holds a master's degree in film project  from Lisbon Film School. After practicing architecture for more than a decade in Lisbon and London, starts working in 2010 as an independent filmmaker collaborating with architects, visual artists, dancers and musicians. Her projects investigate the relations between film, architecture and dance, and involve a sensorial approach to the experience of architectural space. Tânia's first film "La Petite Maison, an architectural seduction" won the prize for best film at "InShadow's Festival 2012" and has participated in Film Festivals all over the world, from New York to Moscow. She co-directed the film Phenomena as a result of an Art Commission supported by Arts Council England.